When I was 23, Garden State was my life. I watched the films so many times, and knew that this was exactly the type of thing I wanted to write. Zach Braff was a hero of mine. Over the last ten years, my tastes have moved on a little, and I perhaps don’t hold the film in quite the same regard anymore (the recent Jezebel rewatch made me cringe) so this was partly why I was dreading our special UK backers screening of Wish I Was Here on Friday at the Cineworld in The O2. For one thing, it started at 6pm which meant I had to call in some favours to leave work at 3. 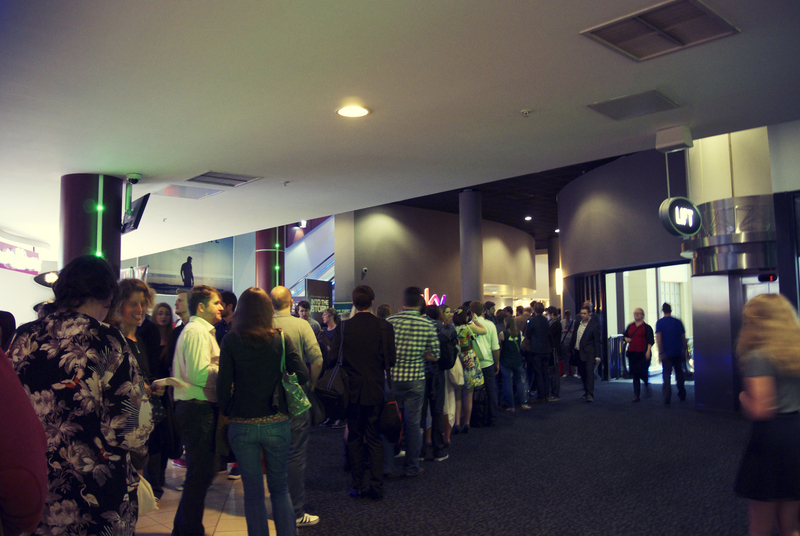 I didn’t relish the idea of trekking up to North Greenwich for 6 (actually, it wasn’t bad at all) and as Husband, Rach, and I got to the cinema lobby, we were greeted by a huge queue. It was shaping up to be a disaster of an evening. 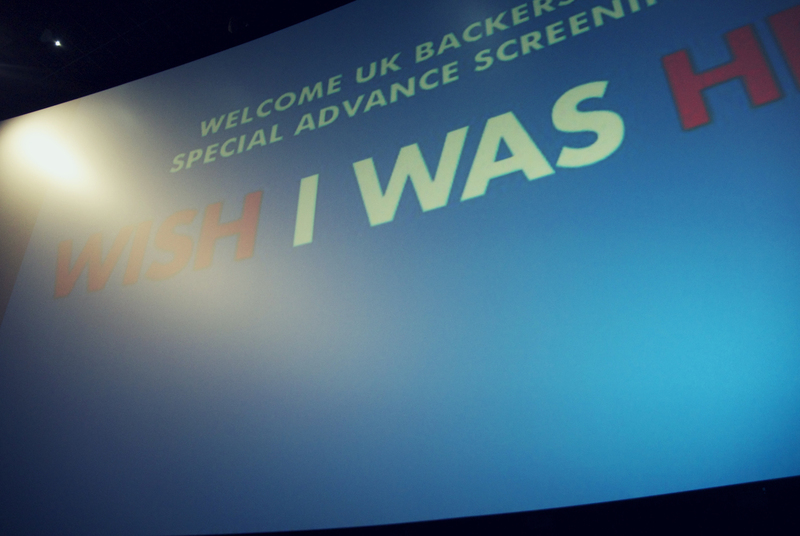 Emails sent from the Wish I Was Here team earlier in the week had started to make us a little anxious as they asked people to switch to the last minute addition of a 9pm screening – I was convinced we’d get to the front of the queue and told they were out of seats. The organisation was a bit lacklustre but we eventually exchanged our Eventbrite tickets for numbered seats (why we couldn’t have had numbered tickets in the first place, I don’t know). There were three people handing out tickets, and as Rach had gone to a different person, she was five rows back from us. We were in row A. Row A in the Sky Superscreen. ROW A. We quickly realised that we would be in quite some significant pain during this film – don’t get me wrong, the seats were mega comfortable, but we had to scooch down and lean back in them in order to see any part of the film. Truthfully, we only saw the middle third of the film. I hope nothing major happened in the other two-thirds. Mandy Patinkin’s beard was pretty much the size of my car. The film needed this screen however, and was ram packed with 700 of the backers – I think 1000 turned up in the end for the two screenings. I was sneakily eyeing up some seats further back but they all got filled. But the third of the film that we saw was better than expectation. Aiden is a struggling actor whose children are in an orthodox Jewish school – a detail I found fascinating and wanted to see more of. His father, expertly played by Mandy Patinkin, has stopped paying the school bills which is how the film starts. It’s clear from Mandy’s first scene that there are some father-son tensions at play, but this melts away as it’s revealed he is dying of cancer. The film quickly changes from a self-centered “woe is me” piece to a look at how a family deals with death, and it’s sometimes hard to watch. There are some sub-plots that were completely unnecessary, like the chubby sweaty nerd suddenly getting the hottest girl at Comic Con because he has a great costume (please), and a weird half-assed sexual harassment thing which just serves to make Aiden take control of his masculinity. Come on now, we don’t need this silly nonsense. I didn’t like how Aiden’s wife Sarah, understatedly played by Kate Hudson, had her “dream job”, which actually turned out to be entering data into a spreadsheet. Who does that in this day and age, really. Even her name badge just had the word “Worker” on it. Oh, how terrible it is to work in an office. There were also quite a few contrived moments and it felt as though he had these great iconic shots planned that he had to somehow get the script to move towards. A shot from above of Mandy Patinkin lying on a hospital bed wearing welding goggles whilst the pink-haired Manic Pixie Dream Daughter hugs him. A shot of the MPD Daughter leaping into a pool overlooking LA. A shot of the family driving along the PCH in an Aston Martin. The film quickly became very crowded with these moments and I longed for a bit more story. That said, I enjoyed the story. Kate Hudson was very good, and one scene between her and Mandy was beautifully written. It was incredibly heartfelt and real and tugged really hard on my heartstrings. The film didn’t drag, didn’t feel like it was too long, and even the superfluous scenes didn’t bother me too much. One thing I loved but Husband hated were the super hero scenes with the little CGI robot. I loved that Aiden wanted so badly to be this super hero, for his children, for his wife, for his father, but everyday life was holding him back. At the end of the film, he accepts that he isn’t and that he’s just a regular person – I wanted more of this analogy and it was very poignant for me. Zach Braff has definitely been unfairly lambasted over the making of the film, and it does not deserve the critical response it’s received. It was clear in the Q&A afterwards that the whole process has exhausted the poor man and it was telling that when someone asked him if he’d Kickstart again, he replied with a loud and resolute NO. We had about 40 minutes afterwards for the Q&A, where Zach bounded around in front of us answering a good number of questions. Terrible seats for watching the film, great seats for the Q&A. 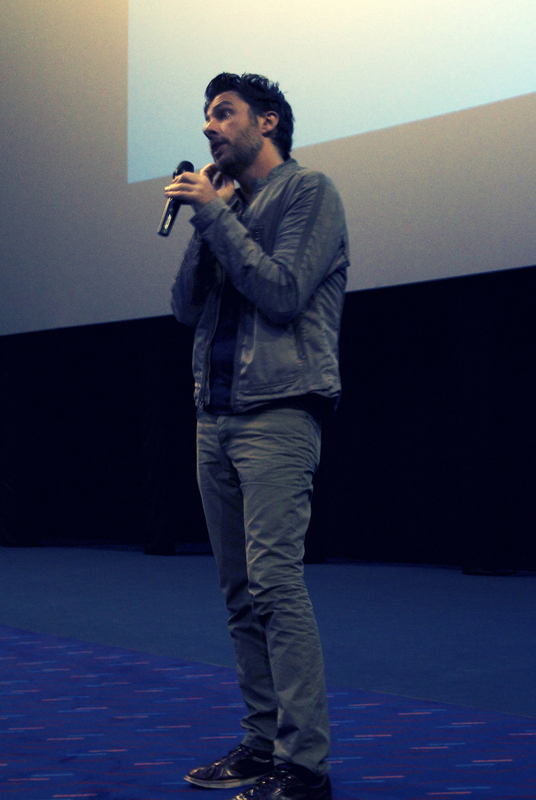 At times, it felt like he was talking directly to us which was so weird and surreal – Zach Braff was stood so close to me that I could smell his aftershave (sorry, weird thing to say). He gave us a background to the soundtrack, to his favourite films of the year, to the making of the film including the fact that he only had Mandy for four days which is astonishing. What started out as a potentially worrying evening actually turned out really well, and I’m glad I made the effort to get to the screening. And super glad that we stopped at the Byron Burger afterwards. ← I’m full, and yet I know if I stop eating this, I’ll regret it. I still love Garden State, even though I was glad to hear that even Zach knows the structure of it is insane and the plot is vague. I don’t think I’d say I loved Wish I Was Here as much, although that’s at least 70% down to that Rabbi’s lip and just the sheer amount of beards and their sizes on that screen. I also feel that my lack of human emotions come into play sometimes when watching things. I mean Zach was talking about watching men cry and I was sitting there thinking “where? Where’s the part you’d cry at?” and I wanted that scene between Sarah and Gabe to hurry up and be done with much sooner. I’ll have to say this, then run and hide. I don’t see what everyone else seems to see in Garden State. It was just a bit … eh, alright. I think you waited too long to watch it. I mean not in the sense of WAITING but that if you’d seen it when it came out maybe. But by the time we (I) forced you to watch it, it was a bit eh. To be honest I think if I’d never seen Garden State and I watched it for the first time now I’d probably fall asleep or punch it in the face for being too pretentious like I’ve done with Josh Radnor’s movies.